Set with over 100 black and white diamonds, this spectacular watch is fashioned out of solid 18k white gold. 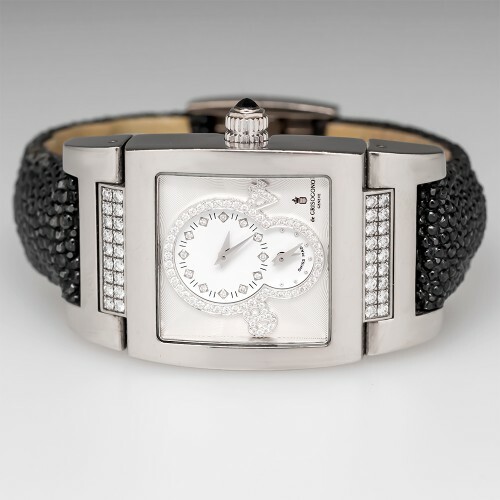 The pave-set band is inlaid over a stingray leather de Grisogono strap, and the mechanism is visible through the glass case on the backside of the watch. This masterpiece in time technology was crafted by the jewelry firm de Grisogono as part of their Grande Collection. Founded by Fawaz Gruosi, de Grisogono has been dedicated to absolute perfection and continual innovation in jewelry and watch design since 1993. De Grisogono jewels are characterized by bold and exuberant designs executed with cutting-edge techniques, creative twists, and absolute perfection. Every de Grisogono jewel features bold and often neglected gemstones, asymmetrical design elements, and breathtaking glamour. This particular watch is a testament to de Grisogono's signature use of the previously ignored black diamond. Historically, until Fawaz Gruosi began integrating black diamonds into his creations, they were largely overlooked by designers in the luxury industry. Thanks to Mr. Gruosi's passion for overlooked beauty, today black diamonds firmly hold their place in court with majesty, mystique, and allure. Fawaz Gruosi is a man of intense curiosity, adventure, and passion. His Mediterranean roots shine forth in his bold use of color and his infinite reinterpretations of form and line. He approaches everything with emotion, purpose and intensity, and this shines forth in every piece his firm produces. Mr. Gruosi puts great stock in his intuition, and while paying tribute to the esteemed traditions of jewelry design at all times, he continually pushes the boundaries of the industry, propelling his jewels into the most elite of haute couture style. In the area of watchmaking, de Grisogono has taken tradition and built upon it, inventing never-before-seen complications that set de Grisogono far apart from its watchmaking competition. While de Grisogono is fully committed to Swiss watchmaking heritage, they have pushed the boundaries of tradition to create exclusive in-house movements with ingenious complications. With these innovations, Mr. Gruosi and his team of skilled watchmakers have added value and exclusivity to their Swiss watches. Mirroring the ingenuity on the inside, they've brought to light the mystical allure of never-before-seen materials, including stingray leather, black diamonds, and icy phosphorescent diamonds, gemstones that have become the signature of de Grisogono's watches and high jewelry. de Grisogono's watches are a testament to Fawaz Gruosi's impeccable design philosophy. "I design out of instinct and express my inner passion into unexpected and extravagant creations," says the legendary designer on his website. The origins of his philosophy grew out of his childhood experiences in Florence, Italy. Born in Syria in 1952, Mr. Gruosi eventually moved with his Italian mother and Lebanese father to Florence where he lived until he was 18 years old. His first jewelry-related job was as a janitor in a Florence jewelry store. Following his passion for gemstones and design, he was soon promoted to store director in London. From there, he became Harry Winston's representative to the Alizera family in Saudi Arabia, and from there the doors to Europe's most esteemed jewelry houses opened for him. By the mid-1990s, Fawaz Gruosi was ready to take his mastery to the next level. He opened his first solo boutique in Geneva, where he established the adventurous de Grisogono brand. His commitment to excellence and his courage in pushing the boundaries of design tradition quickly catapulted the brand into high jewelry fame. Today, de Grisogono continues to draw from Fawaz's pursuit of technical virtuosity and vanguard design. Mr. Gruosi's designs are inspired by his unique experiences and everything in the world around him. Whether inspired by "the shape of a lampshade or the color of the sea," he expressed to Huffington Post writer Yvonna Russell, Fawaz aims to highlight the natural beauty of the men and women who wear his pieces. "I do not have a particular woman in mind when I design. I make the piece, and the right woman will be drawn to it," he told Ms. Russell in the same interview. Are you drawn to the lines of this de Grisogono masterpiece? Are you inspired by the unconventional use of rapturous gemstones in traditional settings with an edge? If so, we cannot recommend more highly the high jewelry and timepieces created by the masterful designer and artisans at de Grisogono.